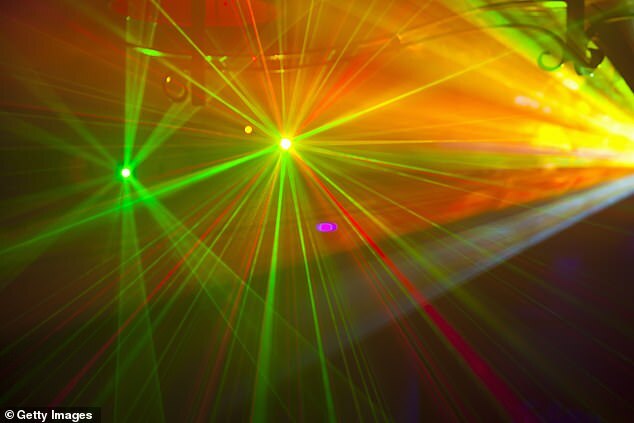 Researchers have revealed a radical laser gun that can beam audio directly into a person's ear across a room. Researchers from the Massachusetts Institute of Technology's Lincoln Laboratory have been able to transmit various tones, music and recorded speech at a conversational volume. They say they breakthrough could have a dramatic effect on everything from warfare, allowing messages to be sent to troops, to being heard across a noisy room. 'Our system can be used from some distance away to beam information directly to someone's ear,' said research team leader Charles M. Wynn. The system uses a technique known as the photoacoustic effect, which occurs when a material forms sound waves after absorbing light. For their project, the researchers used water vapor in the air to absorb light and create sound. 'This can work even in relatively dry conditions because there is almost always a little water in the air, especially around people,' said Wynn. 'We found that we don't need a lot of water if we use a laser wavelength that is very strongly absorbed by water. In a paper revealing the project, they write it could be used everywhere from in the home to large outdoor spaces. 'Communication across noisy rooms, hail and warn applications, and localized communication directed at only the intended recipient are a few possibilities. One of the new sound transmission methods grew from a technique called dynamic photoacoustic spectroscopy (DPAS), which the researchers previously developed for chemical detection. The researchers change the length of the laser sweeps to encode different frequencies, or audible pitches, in the light. One unique aspect of this laser sweeping technique is that the signal can only be heard at a certain distance from the transmitter. This means that a message could be sent to an individual, rather than everyone who crosses the beam of light. It also opens the possibility of targeting a message to multiple individuals. In the lab, the researchers showed that commercially available equipment could transmit sound to a person more than 2.5 meters away at 60 decibels using the laser sweeping technique. They believe that the system could be easily scaled up to longer distances. They also tested a traditional photoacoustic method that doesn't require sweeping the laser and encodes the audio message by modulating the power of the laser beam. Next, the researchers plan to demonstrate the methods outdoors at longer ranges. 'We hope that this will eventually become a commercial technology,' said Sullenberger.